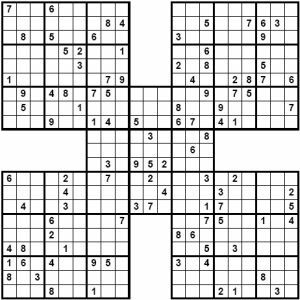 Samurai sudoku is the name given to a set of overlapping sudoku puzzles. Samurai puzzles usually contain 2, 3 or 5 puzzles that overlap in one box region. Due to their large size it is difficult to play these puzzles online, therefore our samurai sudoku puzzles are available to members in PDF format for download.